Hanuman is a very popular God in Hindu Religion.Hanuman is considered to be the eleventh incarnation of Lord Shiva. Sri Hanuman is a celibate god who is symbolic of strength, divinity, courage, knowledge and devotion. Reciting the Hanuman Chalisa or Hanuman Mantra helps to overcome fear and bless with courage and wisdom. 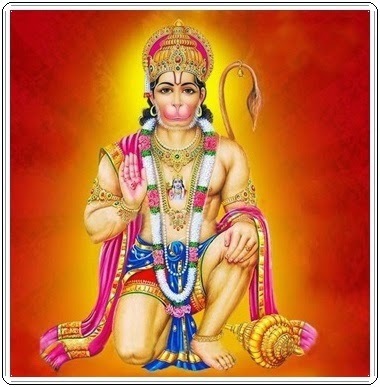 I surrender to Lord Hanuman whose pace is rapid like wind and quick as the mind, who is very intelligent, who has constrained his sense organs and who is the son of Vayu (Pawan), the chief of monkey tribe and the messenger of Shri Rama. His pace is as rapid as the wind and as quick as the mind. Om hraam hreem hroom hram hroum sakala bhoota pretha damanaaya swaha"